Last weekend was my first time visiting the Mima Mounds and I can confidently say it won’t be my last. To be honest, I grew up in Washington and hadn’t even heard of the Mima Mounds until I was assigned this story. 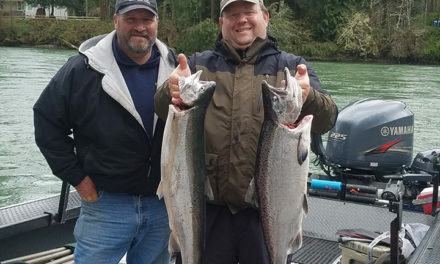 With multiple trail options, some short and some long, the Mima Mounds has something for everyone. 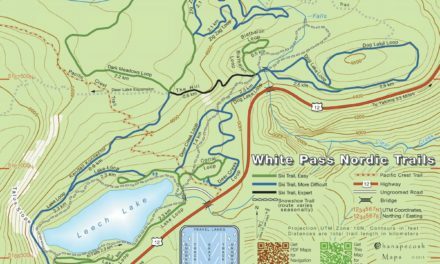 Any of the trail options are a perfect choice for people who aren’t looking for a labor-intensive hike (like me). The most interesting thing about the Mima Mounds is that no one truly knows how the 640 acres of bumpy land formed. Popular theories include glaciers, floods, earthquakes and pocket gophers. One explorer in the 1800s thought the mounds were a burial site but he dug into three mounds without finding any bodies. Researchers think they have ruled out the possibility of aliens having anything to do with the unique landform, but I’d like to think that option is still in the running. Natural Areas Manager for the Pacific Cascade Region Renee Mitchell said people come from all over the world to see this geological mystery. One of the other attractions the landmark holds are the endangered species that can be seen while visiting, such as the Mazama pocket gopher. 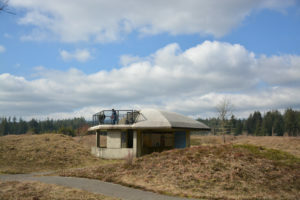 Visitors stand on the observation deck at the Mima Mounds on Saturday, March 9. Throughout the year, different flowers bloom on the mounds, setting a colorful scene on a sunny day. When I visited, the mounds were mostly covered with lichen and grass, but later in the spring there will be plenty of wildflowers to see. The best time to see wildflowers in full bloom is between May and August, Mitchell said. During the summer months, there will be a pretty contrast between the blue camas flowers and the yellow Western buttercups. It is not uncommon to see charred remains of plants as well, which are the result of managed burns performed by the Department of Natural Resources in an effort to manage invasive, non-native plants. According to the department, the Mima Mounds are one of only 17 national natural landmarks in Washington. There is a main half-mile paved pathway that winds throughout the mounds, which is also ADA accessible. 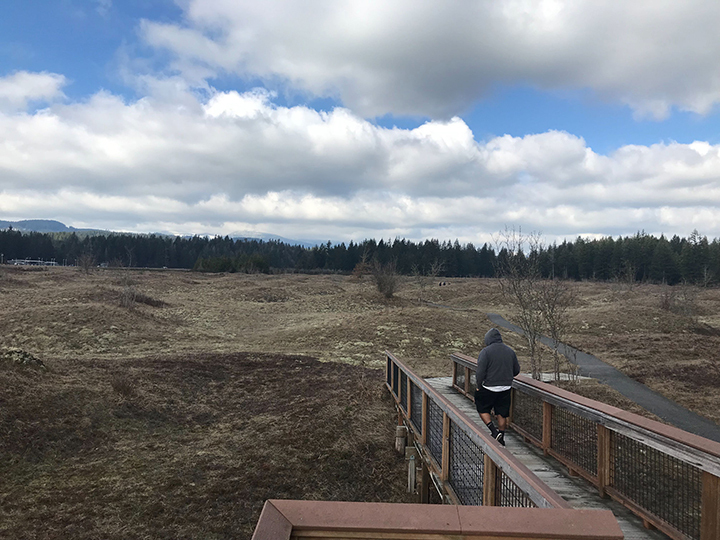 The Mima Mounds’ paved trail is one of the best ADA accessible trails in Thurston County, Mitchell said. Informational signs and photos are available along the path with accompanying pictures of plants, site history and trail maps. When first entering the trailhead, there is an observation structure that acts as the interpretive center for the mounds. Each wall inside the structure has information and pictures that include theories on the mounds’ formation, the prairie ecosystem and history. Further out on the paved trail is another observation point with a ramp leading up to a lookout point. On a clear day, this would be a great spot to see the mountains. Off of the paved trail there are two other gravel trails that lead you through other areas of the mounds. There are about 3.3 miles of trails to be explored, each view a little different than the last. Even though the Mima Mounds might look like just a bunch of piles of dirt during the early spring, the mystery behind their formation is enough to make a trip enjoyable any time throughout the year. If you’re planning a first-time trip to the Mima Mounds, do not make the same mistake I did by trusting Google maps. Follow the directions given by the Washington Trails Association, www.wta.org/go-hiking/hikes/mima-mounds, which will lead you straight to parking and restrooms. (You will need a Discover Pass!) The Mima Mounds are open all year, seven days a week, with varying hours based on the time of year. For more information on the Mima Mounds or volunteer options, visit the Department of Natural Resources website at www.dnr.wa.gov/MimaMounds.